If you like your music to build, break and crash. Then this is for you. From the gripping lyrics to the soulful guitar tones, this album is vintage and raw. 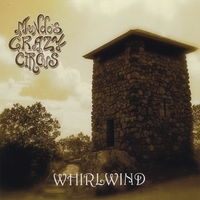 Mundo's Crazy Circus has become an institution in the Jam Rock scene in Boston, MA. They have built a devoted following over the last three years and continue to received with energetic enthusiasm from fans in packed clubs. Chief songwriter/guitarist, Keith Doyle, assembled this band of local musicians and friends per the request to fill an opening slot for a show in Boston and the rest is what we say, History. After several incarnations of the band, Keith settled on a line-up that matched the intensity of the music with the chemistry of the musicians. Mark D'Entremont (bass) has been a mainstay in the Boston music scene for over a decade. His crunching rhythm and versatility puts him in a league of his own. Brian Fowler (drums) gives the band a one/two punch… a tight sound wile letting the rest of the musicians challenge each other as they push the envelope further into the Rock N' Roll realm, allowing the band to breathe as they shift their catalog into high gear. Jaime Vanloon (acoustic/electric guitar) challenges Keith on stage as well as in the studio with his crisp rhythm style of guitar; their interplay is original and powerful. The band decided to go with one time Vocalist Sara Mae Williams (vocals/acoustic guitar) to match the energy and style of this music collection. "Mountain of hope shine your light on me now, Let my expectations rise, Not enough to conquer the world in one day, But just enough to survive". Keith's songwriting is really about making it through life on your own terms and not being bogged down by the day-to-day struggles, past mistakes or abusive relationships. The lyrics that open this paragraph is from their anthem "Mountain of Hope" from their Debut CD titled WhirlWind. Another track, "Velvet Sky" lays it all on the line with the lyrics "slowly my soul begins to twist & ache, feel the seasons darkest break, change of times simply means change of time, nothing seems to fall to waste". The originality and songwriting is what makes the Circus able to celebrate on the possibilities of what the future holds and the future is bright. After reading the rave rewiews over the web i had to check for my self and searched many others web site to catch different clips from other places to download it after bruising for an hour listening to 30- 40 sec clips per site. I loved what heard. So what the hell i bought the CD and it's great flowing recording the music arrangement is great... Heavy over tunes of guitar leads and heavy organs through out the cd.... The sytle of the music ir rock with a heavy southern vibe... Very Good! Some real great funky blues moments then it changes to some proggy blues..all round great album thanks so much! !